Food is a basic part of our culture. 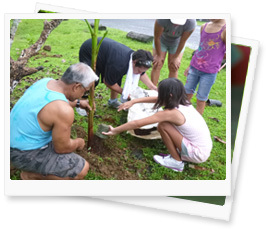 When we promote our island foods, we are also promoting the traditional Pohnpeian way of life and farming system. As the forces of globalization affect indigenous peoples' traditions and food availability, it is imperative that traditional knowledge on agroforestry and cultural beliefs surrounding food are preserved for future generations. Connection to the land and local ecosystems is one way to do this. Consuming island foods provides protection against many nutritionally-related diseases including: diabetes, heart disease, certain cancers, vitamin A deficiency, and anemia. Health problems emerged from the 1970s with the dietary shift to imported processed foods, resulting in the level of non-communicable diseases being identified as a health emergency in the region. Nutrient-rich staple food crops have been substituted by imported white rice. This present staple in the Micronesian diet has no beta-carotene (provitamin A) for protection against these preventable diseases. Many imported foods are highly processed with very poor nutritional value and contain high levels of sugar, fat and salt causing the deteriorating health of island people. 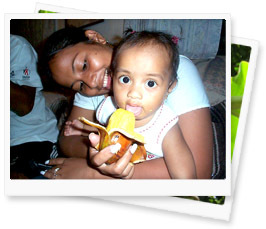 See Local Island Foods & Nutritional Value for information on how island foods benefit our health. Traditional island foods are also generally produced without the use of chemical fertilizers and pesticides which have been linked to a range of health problems, including obesity, and are alarmingly ranked among the top 3 cancer risks. Local food helps protect the environment through the reduction of waste, climate change mitigation, negligible ‘food miles’, soil benefits and biodiversity, among others. When you grow or buy fresh local food there is no packaging that takes hundreds of years to decompose leaching toxins that harm animals, humans and the environment. They do not need to be transported large distances and kept cool using excessive amounts of energy between producer and consumer, referred to as ‘food miles’. By maintaining our lush food forests we also act on climate change by cleaning the air and sequestering carbon. The soil is protected by our trees from erosion and landslides and thrives in an organic environment without the widespread use of chemical fertilizers and pesticides that harm our waters, our health and our soils. By growing and eating local foods we can contribute immensely to a healthy sustainable environment locally and globally. By purchasing local foods the money stays in the country and supports the grower’s family and the national economy. By growing local foods people are less reliant on the cash economy for survival and can obtain nutrient-rich sustenance with very little input. Surplus can also be sold or preserved, with opportunities for entrepreneurial food processing initiatives existing. Furthermore, agricultural production for local consumption is an import substitution policy that would help the Federated States of Micronesia national economy. Food security refers to having sufficient nutrient-rich food locally available and accessible and the resilience to the possibility of disruption or unavailability of food supply. Partial self-sufficiency in food production limits the risks if food shipments are disrupted on route. A local food system is one where food production and distribution is geographically localized rather than globally sourced, processed and transported. This has many benefits for environmental sustainability, for ourselves through the freshness and local varieties of products, the health of our community, culture and the local economy. Knowledge helps change attitude. Attitude helps change habits. Start with yourself. Start by making a commitment to eat some local foods at every meal. Try to substitute imported foods with local alternatives whenever you can. Talk to your family, community and workplace about having a local food policy. Many groups have pledged to serve local food at events and have banned unhealthy soft drinks. Island Food Community offers presentations to groups about the CHEEF benefits of the Go Local campaign. Grow a small food garden at home or at your workplace. Local foods are easy to grow and maintain with minimal inputs. Planting, maintaining and harvesting also gives you physical exercise. Banana and other indigenous food plants are available at Island Food Community of Pohnpei genebank in the Botanic garden for a donation. 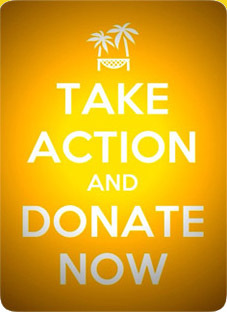 Information on gardening is also available at the Division of Agriculture, Division of Forestry, College of Micronesia Land Grant Cooperative Research Extension and the United States Department of Agriculture Natural Resources Conservation Service. The Island Food Community designed oven is a healthy cooking method for local foods without any electricity costs or use of unsustainable fire wood or fuel. 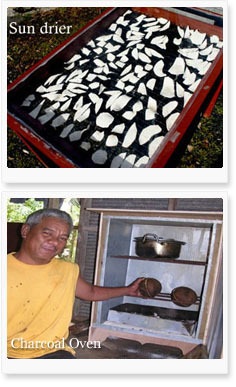 The smokeless oven uses coconut shell charcoal to efficiently cook foods in less time. These can be purchased at Island Food Community. Please contact us for more information. Sun drying is an effective way to preserve foods. Local tropical foods of the Pacific such as bananas, papaya, mango, pineapple and coconut can be dried for sweet snacks. Giant swamp taro, breadfruit, bananas and coconut can be dried for flour. Fish can also be dried. You can purchase a sun drier at Island Food Community or you can simply place your foods in the sun on trays with netting to prevent insects. Many other island foods can be preserved into jams, chutneys, sauces, pickles, chips, juices etc. Share your island food recipes with the community. Micronesian island foods are very nutritious and healthy. Banana, breadfruit, yam, giant swamp taro, other root crops, pandanus and coconut are the traditional staple foods of Pohnpei eaten along with fish and other seafoods, meats and fruits. Some varieties of these foods are particularly rich with vitamins and minerals and Island Food Community of Pohnpei has been instrumental in analyzing the nutrient content of a number of these island foods and their numerous varieties. This ground breaking research involved taking samples to Australia, Fiji, New Zealand, Switzerland, and United States for analysis. Through our research it was found that local island foods can be very high in provitamin A carotenoids. Yellow and orange fleshed varieties of banana, breadfruit, giant swamp taro and pandanus are carotenoid-rich, protecting our bodies against cancer, heart disease, diabetes, anemia and Vitamin A deficiency disorders. The Island Food Community Genebank Research and Distribution Center has many of these rare carotenoid-rich varieties at Kolonia and Mandolenihmw sites. These varieties have come from Pohnpei and the islands of Mwokilloa, Pingelap, Nukuoro and Ngatik/Sapwuahfik. Plants are available to the public and we welcome a donation. Bananas are an excellent part of the daily diet. They provide you with energy and potassium and are known as the good mood food for the tryptophan protein that turns into serotonin, a natural mood enhancer. There are over 50 banana varieties in Pohnpei. The Karat banana contains significant levels of riboflavin (vitamin B2), niacin (another B vitamin), and alpha-tocopherol (Vitamin E) and is great in smoothies. The Taiwang, like Karat, is also carotenoid-rich and is a good choice for drying into chewy snacks and for using in baking due to its sweetness. Utin Iap, Utimwas, Karat, Mangat, Ihpali, Iemwahn,Utiak, Karat en Iap, Taiwang, Peleu, Akadahn, Akadahn Weitahta, Kudud, and Utin Kerenis. Breadfruit still maintains a tremendous importance culturally for Pohnpei. Before normal consumption begins, the first harvest of the main season (rahk) must be presented to the paramount chief (Nahnmwarki) and then a presentation must be given to the village chief (Soumas en kousapw). There are over 130 documented varieties of breadfruit with seeded breadfruit (meikole) containing rich levels of beta-carotene, the most important provitamin A carotenoid, and other carotenoids (lutein) having demonstrated health benefits. In addition, breadfruit can contribute significant amounts of essential vitamins, minerals, and fiber to the diet, due to the levels of breadfruit that may be consumed. Pohnpei breadfruit varieties have different textures and tastes and are eaten in many forms: fresh (green, half-ripe and ripe), dried into flour, or fermented. Giant swamp taro is a rich source of essential minerals (iron, zinc and calcium), vitamins and fiber. As there are more than 40 giant swamp taro varieties, chose those that are orange fleshed. Giant swamp taro can be grated, sun dried and processed into flour as a substitute for wheat flour in cooking. Pandanus fruit, made up of individual pieces called keys, contains large amounts of beta-carotene, provitamin A.
Pandanus is a great food crop for atolls as it is salt and wind tolerant and helps protect islands from erosion as sea levels rise. It is important for its leaves, wood, and roots, which are used for handicrafts, construction, medicine, fuel and other purposes. There are 21 named pandanus varieties. Drinking coconut contains energy, Vitamin C, B1, B2, calcium, iron, niacin, and some protein. This is a valuable drink for rehydrating when affected by sickness and diarrhea. The mature coconut provides significant amounts of fibre, protein and some substances that have antioxidant properties. Although mature coconut has high fat content, fat is an essential nutrient that is needed for energy and to aid the absorption of certain vitamins. Coconut fats may also have a role in destroying viruses, bacteria and protozoa in the gut (and possibly elsewhere in the body). The fats have an effect in reducing unwanted inflammation and coconut fibre has been shown to reduce blood lipid levels. Papaya is an excellent source of provitamin A and vitamin C and aids digestion. It can be eaten green and used in cooking or salads, but its most delicious and nutritious form is when it is orange, ripe and sweet. The seeds of the papaya can also be a spicy addition to foods. Papaya has many health benefits for a number of ailments. Local citrus varieties and soursop are high in vitamin C which assists in the body's absorption of iron and supports the immune system. Yam is one of the most important crops in Pohnpei for its cultural status. It is used in traditional feasts and the size of yams is highly prized. There are 171 documented yam varieties. Tapioca, also known as cassava, provides the body with energy. It also contains vitamin C, potassium and dietary fiber. Its leaves contain large amounts of provitamin A, vitamin C and fiber. Fish is an excellent source of protein, several vitamins, minerals and omega-3 fatty acids which are essential for normal body functions and can only be obtained from food such as fish. See Research & Resources for more detailed information on this page. If you want to know more... sign up for a free subscription to the Go Local! Newsletter. Copyright © 2013 Island Food Community of Pohnpei. All Rights Reserved.